"A hearty version of chili with steak instead of hamburger." In a large pot over medium high heat, combine the oil and steak and saute for about 5 minutes, or until steak is browned. Add the onions, garlic and chile pepper and saute for another 5 minutes, or until the onions are translucent. Add the chili powder, cumin, cayenne pepper, tomatoes and kidney beans. Reduce heat to low, cover and simmer for about one hour. Remove cover and simmer for another 30 minutes, or until you've reached your desired thickness. recipe followed exactly. wasn't thrilled with it the first day, and didn't thicken too much after that. 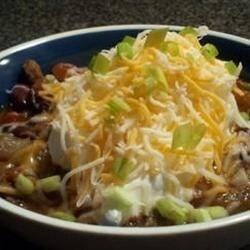 I prefer "Texas" chili to regular hamburger chili and this recipe was a good jump off point. I added a can of beer to the sauce which I find tenderizes the meat. I also added japolenos for spice. i made this exactly as is and i LOVE it! I like things spicy, and the heat and flavor level in this is fantastic. definitely a do again :). This is great! I use serloin steak and sub the 2 cans of toms w/2 cans of fire roasted toms plus one small can of tom sauce. We love it!! !